The CamelopardalidÂ meteor shower will occur for the first time ever tonight, May 23, stretching into the early morning of May 24. 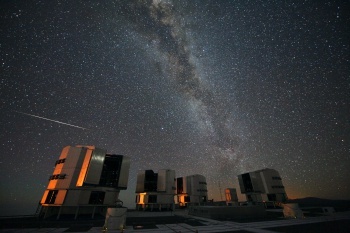 North Americans will have the best view of a new meteor show that will result in up to around 1,000 shooting stars per hour, experts say. Beginning at around 10:30 p.m. EDT and peaking between 2 and 4 a.m., the meteors will originate near the constellation Camelopardalis, near the North Star, but can show up anywhere in the sky. In the 1800s, comet 209P/LINEAR left a trail of dust in space, but it was only recently that Jupiter's gravity pulled this debris into the Earth's orbit for the first time. Tonight's shower will occur as the Earth passes through this dust trail. As the dust particles hit our atmosphere, they will vaporize and leave bright streaks in the sky. Depending on how much debris was left in space, we could see up to 1,000 or so shooting stars per hour - or potentially much fewer, if little debris remains. I saw my first meteor shower last summer, and it was spectacular. It was the August Perseid shower, which resulted in meteors whizzing by so fast that I'd have to confirm with my companion whether my bleary eyes were deceiving me. The Camelopardalids will be moving slower than the Perseids, though, and should be easier to spot. If you plan on watching, find a place with a wide, unobstructed view of the sky. If you can lie down either in a lawn chair or on the ground and stare straight up, you'll save yourself some neck strain. Meteors tend to come in groups of two of three that will fall within a matter of seconds before a dry spell of a few minutes. What meteor showers have you seen? Do you plan on watching the Camelopardalids?